Aston Villa fell short in the weekend’s Championship play-off final at Wembley, going down 1-0 to Fulham, resigning the Midlands club to a third-straight season in England’s second-tier. Unsurprisingly, Villa’s starring midfielder Jack Grealish is now being linked with a host of Premier League clubs in the summer transfer window after an impressive season. What Are The Odds looks at the Jack Grealish next club odds market via BetVictor. Leicester City are the current favourites according to the bookmaker to be the destination for Jack Grealish to be playing his football next season. Odds of 2/1 (3.00) indicate it’s likely and no doubt the Foxes need to reinvest and improve after another season of stagnation around midd table. Big names such as Jamie Vardy and Riyad Mahrez are both being linked with moves away from the King Power, so fans will certainly be buyoud with the signing of Jack Grealish. The Englishman, only 22, has never played for any other club than Aston Villa, but his good form, combined with contribution of eight assists and three goals this season will likely bring clubs in the top flight calling. The decision will be for Jack Grealish does he stay and help his hometown club back to the Premier League for another season or go to a higher level to enhance his England call-up prospects. Newcastle United are in at 12/1 (13.0) and Wolverhampton Wanderers at 16/1 (17.0) - both are a long outsiders in this transfer market and it would appear Leicester are either already pushing the deal forward or there’s little interest from anyone else. One club not in the Jack Grealish next club odds market are Manchester United, and intriguingly today the Metro are reporting (amongst others) that Jose Mourinho’s side are lining-up a shock move for the Villa man. This one could end up rumbling on for a little while yet, so What Are The Odds will monitor the Jack Grealish odds and update accordingly if United or any other top-flight clubs enter the running. If you are a fan of reading stories based on in depth stats, check out more articles from SmartBets’ Statistical Analysis. Statistical Analysis looks at major upcoming events with deep dives into historical data to present interesting trends for your favourite sports and teams. Statistical Analysis is one of SmartBets’ two online magazines. What are the Odds looks at the landscape of betting odds to present news articles based on how the bookmakers are acting. Both magazines are purely by the numbers, and the facts presented are always supported by statistics or odds. 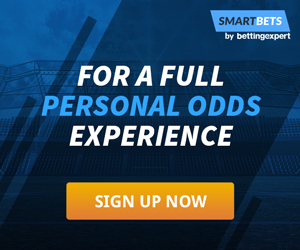 SmartBets is the iGaming industry’s first personalised odds comparison site that helps individual sports bettors find the most valuable odds by pitting leading bookmakers against each other. SmartBets believes in smart betting strategy, and presents information on every upcoming fixture based on past performances of teams in relations to betting markets, league standings, form, H2H and other statistics. We at SmartBets know that every punter is different—but the odds comparison industry is very uniform. That’s why we at SmartBets have made it easy for our users to pick and choose their favourite leagues, teams, and betting markets so that everyone’s personal feed presents matches and odds that matter to them as individuals. Whether you are just a sports fan looking to support your favourite team, or an expert punter looking for value in specific markets and leagues, SmartBets has the best odds for you.